The new season began in soaring temperatures with 11 fixtures, seven of which were in the Black Dragon Badges South division. Eastwood Community were quickly out of the blocks at home to Pinxton, carrying on the form they displayed at the end of the last campaign. A three goal blast in five first half minutes set them up for a notable 4-0 win with Tim Adcock, Kye Hall and Warren Hatfield putting them well in control by the half hour mark. Hall added a second on the stroke of half time, and despite a second half improvement, Pinxton couldn’t reduce the arrears. Hucknall Town are another team of whom much is expected, and they also got off to a winning start with a 3-0 defeat of Collingham. Ben Waplington opened the scoring with just five minutes gone, Adam Nelson doubled the score on the hour, with Montell Gatland adding a third five minutes from the end. Another team making a reappearance after a lengthy break are Selston, who had a see-saw battle at fellow newcomers Matlock Town reserves, the Gladiators coming out on top 5-4. Sean Gregory put Selston two up, Matlock pulling level before Carl Moore again gave the Notts side the advantage. It was 3-3 at the break, Matlock taking a two goal lead before Joe Riley added Selston’s fourth. Scorers for the home side were Dave Edge with two, Marcus Beddoe, Alex Hewitt and Jack Siddall. The two teams transferred from the northern division met at the ATB Civil Engineering ground and it was Sherwood Colliery who claimed the points with a 2-1 defeat of Clay Cross Town. Tristan Burrell struck first for the Wood after just seven minutes, Mark Carter adding a second on 21 minutes. The Millers upped their game in the second half but could only pull one back through Tomas Poole. The other three matches all ended deadlocked. Keyworth United marked their league debut with a 2-2 draw at Swanwick Pentrich Road. Dean Bussey and Luke Burrell scored Keyworth’s first league goals with Ian Milsom and Ash Buxton replying for the Swans. Holbrook St Michaels led through Cornelius Ogunlade at Mickleover RBL, but Micky Moon clinched a point for the Legion. Blidworth Welfare and Belper United plated out a goalless draw. There were just four games in the Black Dragon Badges North division. Ollerton Town made the most of the sunshine at Easington United coming back on the right end of a 4-1 scoreline. The Eastenders took the lead through Alex Dickinson on 20 minutes, but Liam Carver equalised less than a minute later. Jamie Charlton put the visitors in front at the interval, and further goals from Kyle Clarkson and Craig Stanton ensured the points for Ollerton. Newark Town fought all the way against Glapwell, but went down 3-1 at Collingham. 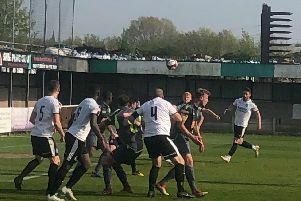 Lee Naughton’s goal was the difference between the teams at half-time, Ryan Cancellara’s intended cross evading the Newark keeper to double the advantage. Jake Reynolds pulled one back for Newark, but Josh Clayton’s goal settled matters in favour of the visitors. Retford made their entrance to the CML a successful one, travelling to Dinnington Town where two Will Tomlinson goals gave them the edge, the second one a well-flighted free kick.